HARTFORD - Staging an epic, nine-play dramatic cycle by one of the great playwrights of the 20th century would be a daunting, emotionally draining task under any circumstances. In the cycle, 22 actors play more than 70 characters in the story of three decades in one man’s life, seen through three generations of three families. Add in the fact that the playwright, Horton Foote, died earlier this year at the age of 92, not long after adapting the plays into a three-part series, and that a longtime champion, director Michael Wilson, and Foote’s daughter Hallie are the two driving artistic forces behind the production, and it’s no wonder that emotions are running high and more than a few tears are being shed as opening night nears. “The Orphans’ Home Cycle,’’ Part 1 of which starts previews on Thursday at Hartford Stage, is considered the Pulitzer Prize-winning playwright’s magnum opus and perhaps his most deeply personal work, based as it is on the life of Foote’s father after he was semi-orphaned at the age of 12 (the boy’s father died, and his mother’s new husband didn’t want him). The plays follow Horace Robedaux on his quest for a true place to call home and his transformations into a husband, father, and patriarch. Set in a small town against the backdrop of a nation in the throes of change, the cycle chronicles the courtship of Foote’s parents (the central characters Horace, played as an adult by Bill Heck, and Elizabeth, played by Maggie Lacy) as well as the lives and loves of various members of the extended family through turmoil, upheaval, heartbreak, and loss. “The first time Hallie saw the opening of Part 1, where we bring out the three Horaces and they magically transform from boy to teenager to adult Horace, she just started weeping because she knew how much her dad would have liked to have seen that,’’ says Wilson, Hartford Stage’s artistic director and the director of the Foote cycle, struggling to contain his own grief at the loss of his friend of almost 20 years. Part 1, “The Story of a Childhood,’’ will be followed by Part 2, “The Story of a Marriage,’’ on Sept. 17, and the final segment, “The Story of a Family,’’ Oct. 8. (Audiences can see all three at once in two Saturday marathons, Oct. 17 and 24.) Following the run in Hartford, the entire production moves to the Signature Theatre Company in New York City in early November. Like “Orphans’ Home,’’ most of Foote’s plays have sprung from the vivid stories that he heard and the ordinary people he observed while growing up in Wharton, Texas - fictionalized in his plays as Harrison, Texas. “He used to sit around and listen to his aunts and uncles tell these stories about the family. He was like a sponge. He was absorbing all this stuff that would someday later serve to help create these incredible plays,’’ says Hallie Foote, who stresses that all of her father’s work blends fact and fiction. The playwright, who is perhaps best known for penning the Oscar-winning screenplays for “Tender Mercies’’ and “To Kill a Mockingbird,’’ conceived of “The Orphans’ Home Cycle’’ in the mid-1970s, not long after the death of his parents. “I think [their deaths] sort of released my father. It gave him permission to now put in writing something he had probably been exploring in his mind for quite some time,’’ says Foote, who is one of the great interpreters of her father’s work. She plays four characters in the Hartford Stage cycle, including a character based on her great-grand-mother, and has portrayed Elizabeth in past incarnations of the plays. Although all the plays in the cycle have been produced over the years, from “Roots in a Parched Ground’’ to “The Death of Papa,’’ which Wilson mounted at Hartford in the late ’90s, and a number have been filmed for the big and small screens, including “1918,’’ “Courtship,’’ and “Lily Dale,’’ the complete cycle has never been staged in its entirety at one time. “By the time I met Horton and his wife, Lillian, they had given up the dream of having all nine of these plays being done together in a theater all at once. They thought no theater would ever have the resources,’’ says Wilson, who first got to know Foote in the late ’80s and early ’90s while working as an associate director at the Alley Theatre in Houston. Wilson spent time with the playwright at Foote’s childhood home in Wharton, which Foote still owned, and he later directed many of his plays, including an acclaimed production of Foote’s “Dividing the Estate’’ on and off Broadway last year. 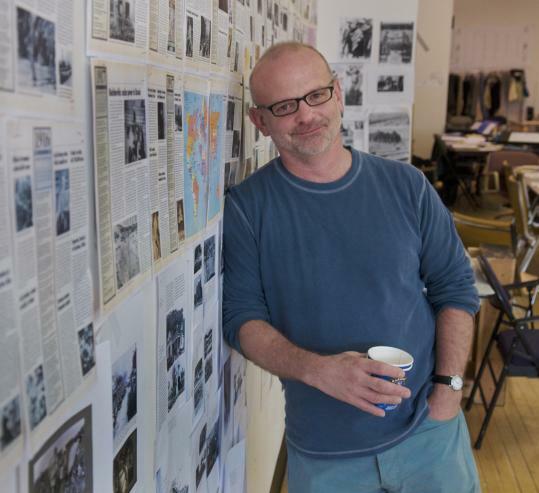 Wilson began to entertain ambitions of staging the cycle, however, after becoming artistic director of Hartford Stage more than 10 years ago. He saw such multipart cycles as Peter Hall’s production of John Barton’s “Tantalus’’ in Denver and Tom Stoppard’s “The Coast of Utopia’’ on Broadway, and he directed both parts of Tony Kushner’s “Angels in America’’ at the Venice Biennale. Wilson understood the cumulative power and possibility of transcendence for audiences watching these kind of can’t-miss, epic theatrical events, with storytelling on a grand scale. He proposed that Hartford Stage commission Foote to pare down his nine plays into three evening-length works. “The idea both thrilled him and terrified him. But he finally took the commission, I think, on a leap of faith, based on our friendship and years of collaboration,’’ says Wilson. Foote was in attendance in January when Parts 1 and 2 of “Orphans’ Home,’’ encompassing adaptations of the first six plays, were read at New York’s Lincoln Center Theater. “That’s when his shoulders really dropped, and he saw the cumulative power of the plays as they built through that day,’’ recalls Wilson. Foote had completed work on the final segment before he passed away last March, after a short illness. It was 10 days before the scheduled reading for Part 3. Now it’s up to Wilson, Hallie Foote, and the rest of the team to bring the project to fruition. “The pressure and responsibility that he felt, we now feel,’’ Wilson says, noting that whenever he’s feeling overwhelmed or emotionally drained, he looks to the spirit of hope and optimism that is a hallmark of many of Foote’s characters. Despite the deep affection Foote held for his characters and his awe at their ability to soldier on in the face of turmoil, the playwright was unabashed in his examination of their foibles, bad behavior, broken dreams, false illusions, and bitter tragedies. Despite Foote’s specificity in chronicling American life, his work has struck a chord with people from all over, says his daughter.